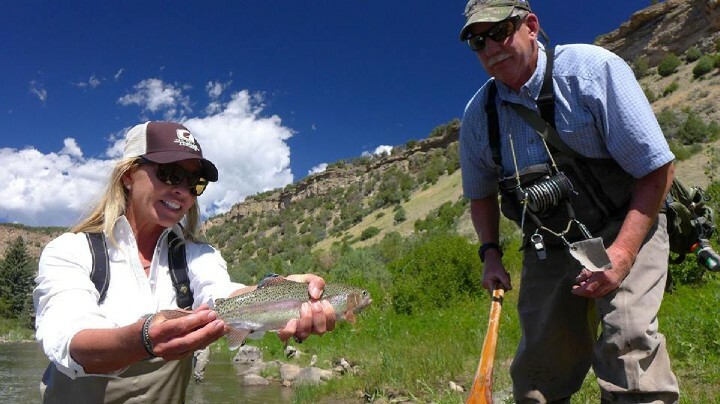 Colorado is best known for its excellent fly fishing for trout but there are many other species of fish to target with a fly rod here in the Centennial State. In the Rocky Mountains of Colorado, trout are the glamour species. They’re the fish that keep fly fishing guides busy working but when guides get some time off they’ll often leave the trout behind for a day or two in search of something different. 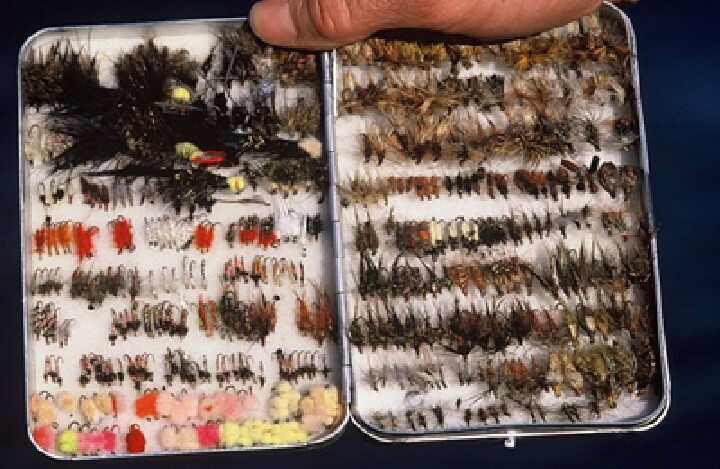 For avid anglers who get their share of trout sipping dry flies, fortunately Colorado offers some very diverse fisheries that offer the chance at new species using different fly fishing techniques. For the landlocked flyrodder in Colorado, over a thousand miles from the nearest bonefish or striper, the key is to be willing to branch out. Let’s get this one out of the way first. Colorado has them all-wild rainbows, trophy brown trout, introduced brookies and native cutthroats. Pretty much any piece of flowing water in the foothills and mountains of Colorado has a fishable population of trout. Add in high country lakes and ponds and an angler could spend a lifetime pursuing trout in Colorado and never scratch the surface. Of course at Vail Valley Anglers, we believe we’ve got the best trout fishing in the state where we live and guide on rivers like the Eagle, Colorado and Roaring Fork. Northern Pike have become a popular target for anglers in Colorado. Their populations have expanded rapidly, so much so that they have negatively impacted some prime trout fisheries. Pike are an aggressive fish that prefer cool water, eat anything they can swallow and offer exciting visual fishing. Some of the best pike fisheries in the State include Stagecoach Reservoir, the Yampa River, Spinney Mountain Reservoir, and Williams Fork Reservoir. For anglers used to catching fifteen inch trout, targeting pike can yield their biggest fly rod catch. Fish over twenty pounds and forty inches long are not uncommon. Use eight weight rods, wire bite tippets and huge streamers fished in shallow bays and sloughs in the Spring and Fall when water temperatures hover around 60 degrees. Fly fishing for carp in Colorado is excellent. Once considered trash fish that would not chase flies, these finicky eaters offer the closest thing to sight fishing for flats species like redfish or bonefish that Colorado has to offer. They are spooky and hard to fool with a fly but they do eat and grow to large sizes and fight well. 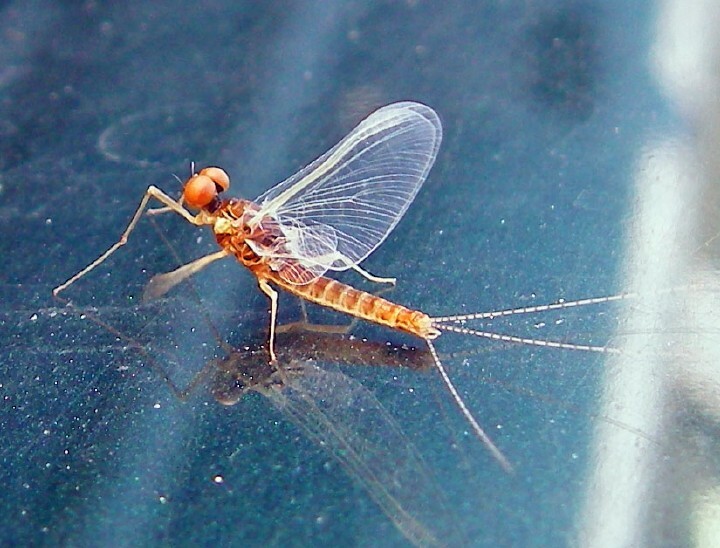 They inhabit most Front Range reservoirs and ponds and even small streams like Boulder Creek. The yellowish bronze colored Common Carp is the most frequent catch but large olive Grass Carp are possibilities in some ponds. One of the better carp fisheries is right in downtown Denver’s South Platte River. At Vail Valley Anglers we target them with small crayfish patterns, streamers and bonefish flies while floating the Lower Colorado River near Rifle and further west. Watch for them tailing and mudding in slow river water or cruising and rooting around on shallow mud flats in any lake. Smallmouth Bass are fairly common in Colorado and they are a great fly rod fish. They readily attack streamers, crayfish flies, poppers and large nymphs. My favorite smallmouth fishery is the Yampa River downstream from Craig, Colorado. Fish over four pounds are landed regularly and the chance to float fish a remote river for bass is a great experience. Many Front Range reservoirs are home to smallmouth. Some of the best include Aurora Reservoir and Horsetooth Lake. Fish for them anytime from late spring through fall. Colorado also has fishable populations of largemouth bass in most Front Range ponds and lakes. In the West try Harvey Gap Reservoir or Rifle Ponds. In Colorado it’s can be difficult to find reliable spots for big largemouth. They just don’t seem to reach their potential, numbers and size-wise here but sometimes farm ponds hold big surprises. Because of the varying weather that shifts from warm to cold very quickly in spring sometimes largemouth spawn unsuccessfully. From late spring through summer, try bulky bunny strip streamers and poppers in the evening and some ponds will give up bass over five pounds so if you find a lake that holds big largemouth enjoy and keep it to yourself! Wipers are one the most exciting freshwater fish to catch on a fly rod and Colorado has healthy, well-managed numbers of this sterile cross between a white bass and a striped bass. Because these fish are sterile, they grow large (over twenty pounds), they are very aggressive and focus on feeding without the interruptions of breeding. They roam many man-made lake systems in eastern Colorado, constantly moving in schools in search of their favorite prey which mostly consists of shad. A motor boat is handy when chasing fast-moving schools of wipers busting bait at the surface. Poppers, crease flies and white and silver baitfish patterns like deceivers will get destroyed when thrown in front of hungry wipers. Size up your rod and leaders-these fish are as strong as many saltwater species. Pueblo Reservoir, Union Reservoir and many of the eastern plains reservoirs have good numbers of these incredible fly rod fish. We snobby trout anglers forget about having fun as a kid catching one sunfish after another. There are plenty of opportunities for catching panfish on fly gear in Colorado and the nice thing is you don’t need any different gear or flies other than your trout stuff. On the Front Range pretty much every pond or lake has a lot of sunfish or perch and sometimes white bass and this is a great way to teach beginners or kids the basics of fly fishing. Try Walden Ponds and Sawmill Lakes near Boulder for big bluegills and pumpkinseeds. Rifle Ponds and Rifle Gap Reservoir in the western half of the state are good spots also. Anglers can catch Colorado’s native Redear Sunfish in many areas. Not really a trout at all but a lake-dwelling species of non-native char, these fish prefer deep, cold water. They have done very well in many of Colorado’s man-made reservoirs. Fish over fifty pounds have been landed in Blue Mesa Reservoir near Gunnison. While not a common fly rod quarry because of their depth preferences, lakers or mackinaw can be targeted at certain times of the year with fly gear. In the fall they seek out shallower gravel bars near dropoffs where they spawn and in the spring just after ice-out they will again seek out the slightly warmer water in these areas to chase baitfish. Sinking lines and weighted streamers are the name of the game. 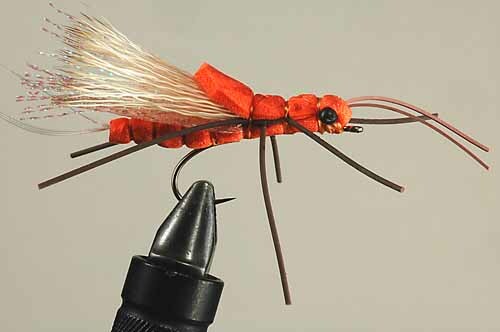 Try large red and white clousers or similar minnow imitations. Occasionally these fish show up below dams in tailwaters like the Colorado River or Frying Pan but stillwaters such as Turquoise Lakes near Leadville and the large reservoirs on the southern and western border of Rocky Mountain National Park are good locations. Kokanee Salmon are a landlocked species of sockeye salmon introduced many years ago in cold and deep western lakes. Their life cycle mimics that of their ocean dwelling cousins in that they spend most of their life off limits to fly fishermen, feeding on plankton in very deep water. After three of four years they make a fall spawning run up whatever feeder streams empty into the lake. This is when Colorado anglers can target them. While not actively feeding, they will still eat small streamers out of aggression, and nymph and egg patterns as well. Kokanee don’t grow as large as sockeyes but can easily reach three pounds or more. They fight extremely hard with superb aerial displays. The most famous run occurs on the Gunnison and East Fork Rivers near Almont but the Blue, South Platte and other Colorado streams have fishable spawning runs. **Vail Valley Anglers guide Bill Perry set a tippet class world record for Kokanee with a South Platte River fish over five pounds. Walleye are probably America’s favorite species of fish to throw in the deep fryer. However, they are definitely not sought after with a fly rod very often. They generally live in the deeper water of many Colorado reservoirs. Strong populations exist all over the Front Range and Eastern Colorado. Years ago, while living in Boulder and fly fishing Boulder Reservoir for whatever I could catch, I discovered that walleyes can be caught on fly. They can also be actively targeted. During early spring they migrate to shallow, rocky banks and flats. This is in preparation for spawning. With a full-sinking or sink-tip line and baitfish flies like Deceivers and Clousers they can be caught. From late spring through fall, night fishing is the best time for fly rodders to catch walleyes. This is because they are searching for prey in shallower waters. Often while trying for walleyes, other species like trout, bass or wipers will be landed. Try the South Platte River below Chatfield Reservoir, Cherry Creek Reservoir, Boyd Lake or many of the other Front Range lakes for walleyes. Tiger Muskies are a sterile hybrid between the Muskellunge and Northern Pike. They grow larger than pike and are more aggressive than true muskies. Because they do not spawn they put more energy into growing large. They are a uniquely aggressive, cool looking fish that require patience and effort to catch. The Colorado Division of Parks stocks small Tiger Muskies. They grow much faster than their parent fish into many lakes to provide sport and control rough fish populations. Anglers in Colorado can and will catch other species of fish with fly rods. Arctic Grayling are present in some high country lakes and streams such as Joe Wright Reservoir. Mountain Whitefish are well established in several popular rivers in Colorado. A variety of suckers, such as the native, colorful and huge flannel mouth sucker, while not prized can also be caught. There’s always a chance for native squawfish out of the lower Colorado River or lower Yampa River. When you fly fish in Colorado, chances are you’ll be focusing on trout and with good reason. At some point, though, all anglers should consider chasing some less popular fly rod fish. It’s a blast and there’s some huge fish out there. At Vail Valley Anglers, we’ve got you covered whatever species you are trying to land. From guided fly fishing for trout, to carp in downtown Denver or a trip halfway around the world for peacock bass or giant trevally, we have the gear to make your fly fishing trip a success.